Funny Mama Ruth of the blog Ruth, the Mom, posted something recently about deciding to remove the ubiquitous television from her family's life. Cue needle scratch on record. That's right. She moved the TV out of their living room and into a small corner of the office, working off the "out of sight, out of mind" script. She and her husband also decided that a single television was plenty for their home. I'll give you a moment to collect your jaw from off the floor. We're also a TV-Free family, which makes many regard us as aliens. Or mutants. People come over, sit down, chat pleasantly and then, after a moment, say "Where's your TV?" I don't mean to sound holier-than-thou on this. Believe me, I was raised by Papa Smurf, just like every other kid my age. And when I outgrew him, Martha Quinn, Mark Goodman and Downtown Julie Brown filled the gap, turned me on to the latest Simple Minds video and generally stoked my teenage angst. But we know better now. And a lot of research has been done on how deep the effects of marketing to children go, and how detrimental the effects are. 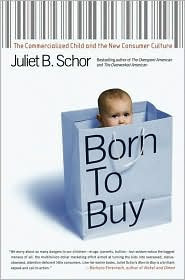 A few years ago, author Juliet Schor wrote the book Born to Buy: The Commercialized Child and the New Consumer Culture. Business Week published a great interview with Schor, where she outlined some of the more disturbing things she discovered while researching her book. For instance, Schor says she was surprised to find "that the more kids are exposed to consumer culture, the likelier they are to become depressed, suffer from anxiety, or experience low self-esteem." Schor's advice? "Get rid of the TV." Also, "Eat dinner together." She promises that for families who start with these seemingly small steps "great things will follow." Interested in delving into this further? Check out the Campaign for a Commercial-Free Childhood. Stace, I completely agree. Engaging with kids is so much more fun as a Mama than it is to sit them in front of a box full of moving images. It's also a lot more reassuring to know that you're the one supplying the information going into that tiny little sponge of a brain, instead of a marketing giant. But I know how tough it can be, and how sometimes you just need a distraction. I try to always keep (washable) markers and crayons on hand, along with paper, to occupy my baby. Thanks for all of your wonderful insight!! xo To you and Cooper!